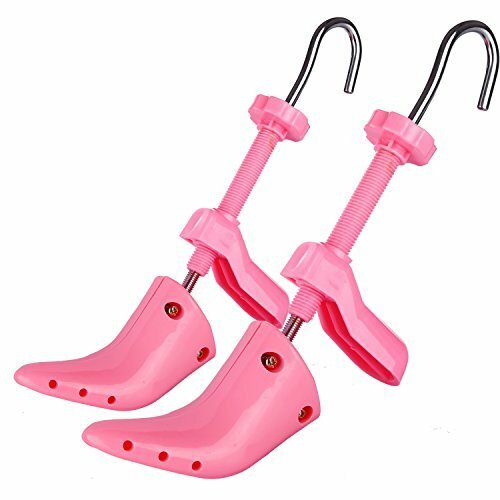 KevenAnna pair of women high heel shoe stretcher 2-way adjustable shoe tree for ladies, professional shoe trees features: KevenAnna high heel shoe stretcher transforms any pair of high heel shoes into perfectly fitting, comfortable shoes. Don't spend weeks breaking in new shoes with these shoe stretchers, your shoes can be stretched both in width and length. The front and back section are made of tough polyurethane plastic and all the mechanical parts are constructed from stainless steel with nickel plating. These outstanding shoe tree can be used for years to come. For the highest class of plastic shoe stretcher, try buys show premium professional two way shoe stretcher today wear your favorite high heel shoes and feel comfortable at the same time description: 6 holes for pressure point relief, come with packet of 12 bunion/corn plugs for stretching specific areas. Size: USA woman's size 4.5–9.5 product dimensions: 15 x 3 x 5 inches shipping weight: 1.5 pounds package includes: 2pcs buys show high heel shoe stretcher. Tips: These shoe stretchers are not suitable for use in wide or narrow width shoes.High heel shoe stretcher is made of tough polyurethane plastic & premium steel shaft .